We will add some relevant IT information here. This could be anything from new industry technology, to how we chose our supplier partners. Why is having double, or even triple screen capability the best investment for task productivity? Since moving to a dual screen environment my level of content output has increased massively. Not only does it improve productivity, but I find my environment much less stressful. When I work from home on a laptop or with my one screen set up, I find myself day dreaming about my desk at work. Who would have thought it? Just as an example, every week I complete KPI's for ABM. This requires me to have an internet browser open, an excel spreadsheet and website statistics. The basic gist of the task is to collect large amounts of data and to transfer it onto a spreadsheet in a presentable format. On one screen I can complete this task in 3 hours. With dual screens I have this done in 2 hours no problem! An hour can make a lot of difference. With a busy work schedule, and several tasks to complete before the end of the day, this hour can be the difference in completing another piece of work. Time is money. The university of Utah completed a recent study, confirming that with two monitors, task productivity increases by 25% and with three monitors 35.5%. This is a link to a study from Dell. They have created a whitepaper detailing lots of statistics and information about dual screen usage. What are the true benefits to multi - screen environments? Productivity - As mentioned this is a major factor in the dual screen environment. Cross Referencing - Instead of flicking through tabs on one screen, trying to find your document and then the information you might be using in another tab. You can have them open side by side. Most tasks require two or more sources of data. For instance, to write this blog post, I had my internet tab open with statistics on dual screen efficiencies, and this website blog page. Multi - tasking - Lots of people find themselves doing two or even three things at once. Most employees and employers have a large range of tasks that require completing before certain deadlines. Having two or three screens allows you to do this effectively. Everything is open in front of you and you can switch easily between jobs. Email / Calendar Monitoring - Most companies require constant checking of their emails and calendars. At ABM, our email is always required to be open ready for support. However, for other companies this could be to receive orders or to ensure you don't miss an appointment. Job Title Requirements - Research suggests that not all job roles will require a multi - screen environment. For example, studies show that its best for writers to have one very large screen rather than two or three. This is because they don't need to do anything else but concentrate on writing. It is up to you to truly decide if you require this for your job. Distraction - Having two screens means you can view two windows open at once, your work and potentially another personal search. Many people could look like they are still working, whilst actually having another personal tab open on the other screen, to minimise when required. Costs - Depending on your choice of screen depends on the costs involved. Most likely, different job titles will require different sized monitors. The larger and higher quality the screen, the more money you will spend. Jobs in design and video editing would obviously benefit from higher quality monitors. Whilst admin and accounts would likely not need the same expenditure. 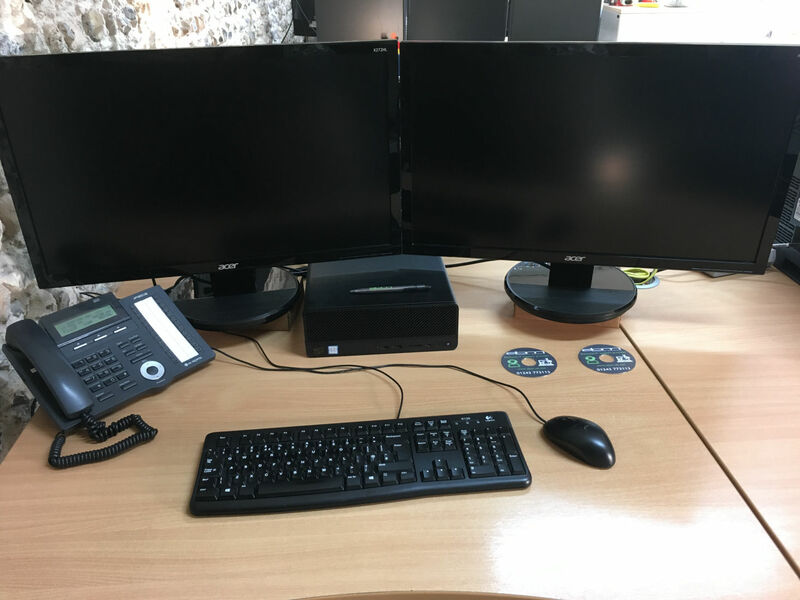 If you are kitting out a new office you will spend more buying two monitors for each employee rather than one. But truthfully if you implement it slowly to see how effective it is, you can spread the costs. Graphics Card / Ports - Your PC requires a graphics card that will support your use of two screens. As well as ports to plug in the monitors. Overall there are negatives and positives. But truthfully the drawbacks can be easily fixed. Simply manage who requires two or three screens. Monitor internet usage if you truly believe your employees are completing personal tasks. There are affordable monitors on the market that still look good! You don't always need to go for the 24" plus, full HD monitors. At ABM we have some affordable options in stock available for purchase. Most modern PC's have a graphics card that support this function and ports for the screens to. If you want to try this function out, we can look into your environment and lend you monitors. Throughout this time observe satisfaction and productivity and then decide. We can quote you for screens, fitting and testing if you require. This opinion may be bias, but it is truthfully worth the business investment. Many companies who have made the transfer have said they would never go back.